I have always felt November is one of the island’s most exciting months. Of course, our well-celebrated Festive Season has lots to offer, from all manner of star gazing to fireworks and a harbor filled with the world’s most fabulous super yachts. But November, when the hotels and many of the shops and restaurants open, is just delightful. Tom Smyth and I have just returned from the island and finalized the addition of new villas. We know you’ll love them. On December 15, I’ll be back on St. Barth for the season. I hope to see you on the island. Villas Aqua & Bleu – This “matching pair” of stunning contemporary 6 bedroom villas is situated just so on the multi-colored bay of Grand Cul de Sac, with private beach access – steps from those warm cerulean waters – complementing the extra-long infinity pools with sweeping views of the sea. Spacious open floor plans include a living room and dining area that open via a bank of French doors onto the pool deck and outdoor living space. Their sleek kitchens are equipped with state-of-the-art appliances and include a pantry and food prep area perfect for entertaining guests. Their six en suite bedrooms include four with French king beds on the beachfront level and two upper-level master suites with king beds and a living area; each opens onto a furnished balcony and the view. Proximity (walking distance) to two casual restaurants, the bars and dining venues of three 5 star hotels and watersports rentals are a “location bonus.” A new affiliation with the luxurious Le Barthélemy Hotel & Spa allows for access and signing privileges. 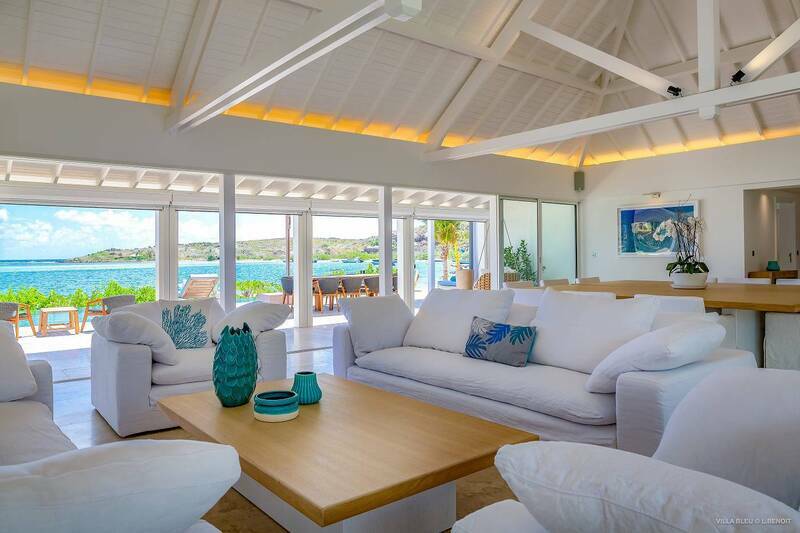 Villa Ganesh – Families looking to enjoy a St. Barth villa vacation need look no further than beachfront Villa Ganesh. Kids will love being steps from the warm waters of gorgeous Flamands Beach, as well as the “cool” pool. It’s the focal point of an expansive deck with lots of outdoor living, dining and playing space. A ping-pong table is sure to get lots of use. All will love being able to walk along the water for breakfast, lunch or dinner at several restaurants or enjoy al fresco meals on the covered dining portico. The modern décor is comfortable and allows for vacation-style easy living. A private upper-level master suite with a king bed features a terrace with a stunning view. A bunk room sleeps four, and there is a third bedroom (with a king bed) across the hall. Each of the bedrooms has a nicely appointed en suite bath. Each has a TV and an iPod docking station for downtime relaxing. What a place to make memories! 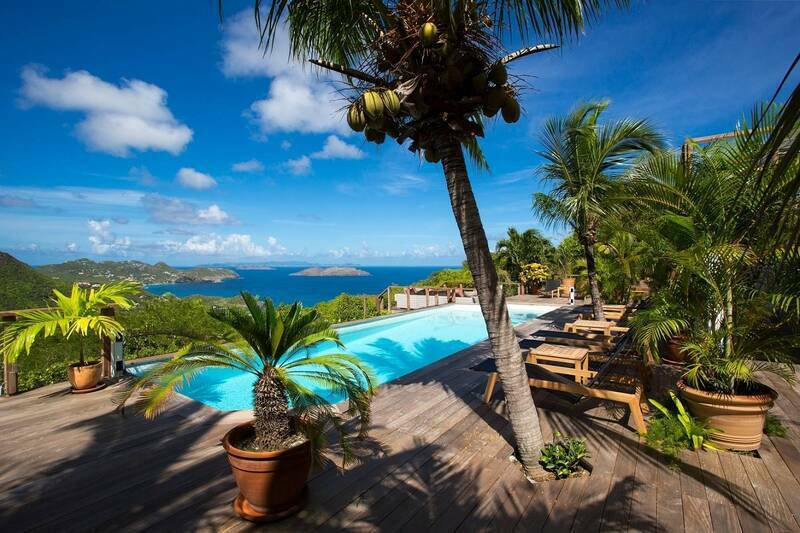 Villa & Hotel Specialist Kathy Schlitzer is just back from St. Barth. On her pre-season inspection trip, Kathy prioritizes hotels. 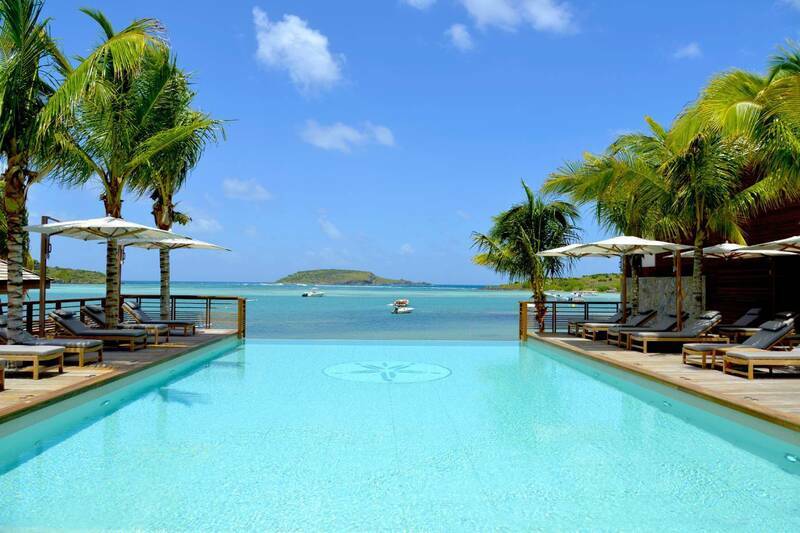 She spent a few nights at St. Barth’s newest hotel, the luxurious Le Barthélemy Hotel & Spa; her room overlooked the pool and the shimmering waters of Grand Cul de Sac. She dined at the seaside Aux Amis – and reports it was “divine.” She was able to fit in a massage at the hotel’s seductive Le Spa and checked out the nail bar and the blow-dry bar – two amenities ladies will love. Kathy also visited Tom Beach to see their refreshed rooms and was happy to note that they now offer U.S satellite TV. Out on Pointe Milou, The Christopher’s enhancements include a newly configured poolside bar by its restaurant Taïno and two new treatment rooms at its Sisley Spa. Kathy rates this spa, where massages and facials are accompanied by the sound of the surf, as one of the island’s best. Le Toiny has a new lunch menu at their Beach Club, and Kathy hopped on one of the hotel’s new Safari Land Rovers to drive down and sample it – and defines this seaside lunch spot as a special St. Barth experience. Felicitations to our hotel partner Le Sereno for being recognized as the best Caribbean resort in Condé Nast Traveler’s Reader’s Choice Awards. Poised on Grand Cul de Sac with dramatic vistas, Le Sereno is an intimate 36-suite property and boasts three stunning villas. 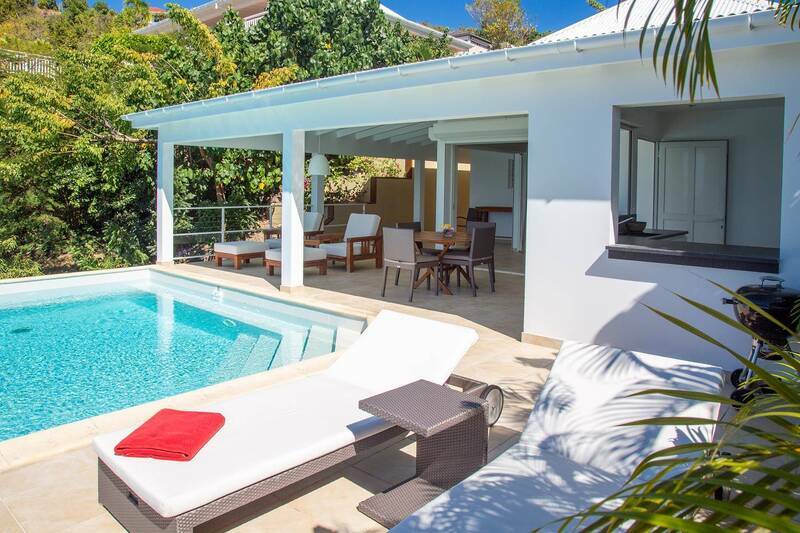 Well located in Petite Saline, this spacious and luxurious 5 bedroom villa is an ideal vacation home. A panoramic ocean view encompasses the islands of St. Maarten and Anguilla, and fiery sunsets add to the ambience. Ample outdoor living space includes a 44 ft. heated pool and bi-level terraces. Two master suites and a en suite guest bedroom are on the main level, and two additional en suite bedrooms are located on the pool level. There’s a full guest bath with a shower on the pool level as well, and a main-level powder room. The living room offers another venue to take in the view, and a sleek, well-appointed kitchen is equipped with high-end appliances. Additional special features include ample parking, a garage and a glass-enclosed air-conditioned gym. 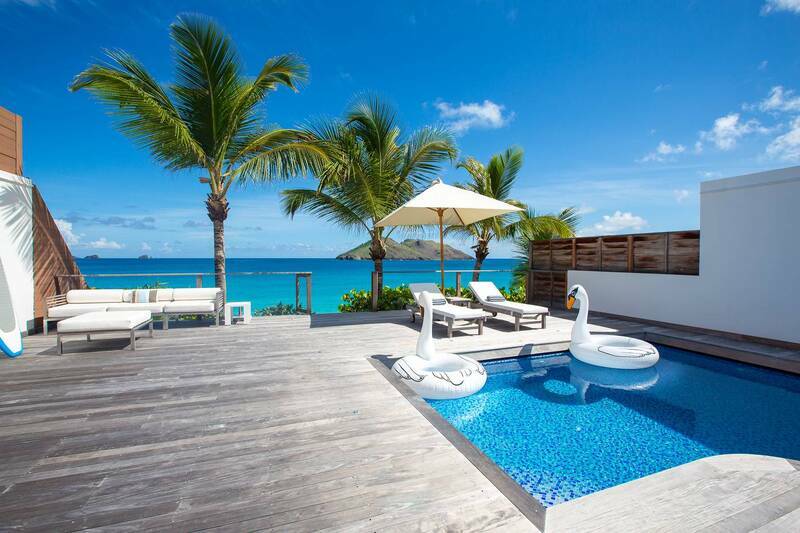 For access to our entire portfolio of available properties, please visit www.sothebysrealty-stbarth.com. We had an awesome, totally relaxing time! Loved Rocamadour and the privacy of the villa. Truly a place for us to renew! We thoroughly enjoyed our private chef, Christophe! Food and wine were spectacular! Thanks to Magda for her help with restaurants. She is so knowledgeable and professional – and fun. Our favorite restaurant was Les Bananiers. Their pizza is the best on the island, and, of course, La Petite Colombe Boulangerie for chocolate croissants and jambon and fromage baguettes.